ok lets be real. If this guy did not have that much money, how many sisters out there will wanna even just do him.NONE! Dude is rediculously UGLY. So let him have it. The only sad thing about it is, all these rappers re out there like that. They say one thing in their music, but really is another thing. Almost all of them end up hooking up with light skin women, making a typical dark skin woman look like trash. But ohh lets see a sister with a white dude or any other dude other than BLACK, then its abomination. I feel dark skin women need some praise, attention and even more respect cos if it wasn’t them there would be nothing like fair complession or light skins or mixed. That how important they r!!!! i just wanted to ask lil wayne what the f**** is wrong with him. 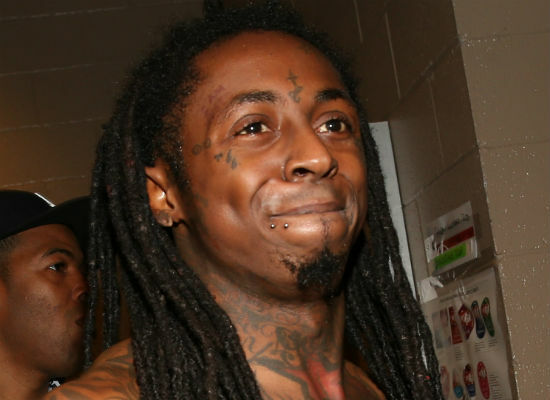 The eyes never lie…Weezy is high in this pic….as for her, she does look young and she might want to put those dollars in the bank. She’s going to need them one day after he find another chick. 2 words she going to need to understand CHILD SUPPORT! this is to I.D. lil wayne always said he liked light skind girls or as he says “redbones” sooooo he is doing what he says in his music. his daughter’s mother is light skin too and they meet when they were 14 soooo this is nothing new. stop hating just be happy for him and pray that the baby is healthy. Yuckaroo!!! she could have lil wayne!! he ugly as hell!!!! but his music is hecka hott though!!! She’s in it for that good money!!! Duh!!! That’s her new Career path Weezys BM!!! She could chant all she wants in her asian accent “Elloo Weezy Baby moma” !!!! Trust me he gonna move right along to the next redbone chick… mattter of minutes… Hey EZZZY Baby whats good!!! EVERYBODY NEEDS TO STOP HAITIN! I AINT SAYIN THAT SHE DONT LOOK TRASHY!! BUT HE GON CHOOSE WHAT HE WANNA CHOOSE!!!! AINT NOTHIN WRONG W/ BEING W/SOMEONE WHOSE A MINORITY!! IM A MINORITY AND D** PROUD OF IT!!! HISPANICS STAND UP! I LOVE MY BLACK MEN AND IF I WANNA DATE ONE I WILL SO YALL NEED TO QUIT W/ ALL THAT “OOOOO A SISTA THIS A SISTA THAT HE NEED TO BE W A SISTA AND NOT A REDBONE OR WHITE WOMAN BLAZAY BLAZAY BLAAA” THIS IS THE 20TH CENTURY DEAL W/ IT AND GROW THE HELL UP!! AND TO WEEZY DO WHAT YOU DO BOO CONGRTS ON YA BABY BOY!! HOPE HES HEALTHY!! AND IF YOU GON COME ON HERE HAITIN ON PEOPLES RACE AT LEAST LEARN HOW TO SPELL!!!!!! EVERYBODY just need to STOP HATIN. yall just jealous of the broad..wishin yall was in her spot..trying yall hardest to find somethin wrong wit her..when its not!!!! STOP HATIN AND BE HAPPY FOR HIM…IF YALL SUPPOSE TO BE FANZ!!!! !